On June 15th, rent regulation laws are once again set to expire in New York, potentially impacting millions of renters. This happens every few years but, outside of a collection of tenant groups, politicians, and journalists, most New Yorkers don’t ever notice. Why should they? More than half of the renters in NYC don’t have any type of rent protections at all — and NYC is by far the largest concentration of rent regulated apartments in the US, let alone in the state. If the rent laws only impact a small (getting smaller) group of renters, who cares? Honestly, in past years, there hasn’t been much reason for market-rate tenants to care. That’s all changed this year. This year we’re fighting for Universal Rent Control. It means what it says — protection for all types of renters. For the first time in living memory, if you’re a market-rate tenant, you have a big, big stake in this year’s fight — it’s called ‘Good Cause’. And we need your help to make sure it passes. The purpose of the bill is simple but revolutionary. If you live in a building with more than 3 units anywhere in the state, you are guaranteed the right to a lease renewal with a limited increase in rent. It’s that simple. And it covers millions of market-rate renters. It is the single biggest expansion of rent protections in New York since rent stabilization was reformed in 1974. That means you won’t have to worry about your landlord jacking up your rent if you live in a gentrifying neighborhood. That means you don’t have to worry about your landlord kicking you out because they don’t like your kids. That means you won’t have to worry about complaining to your landlord about fixing the stove because you’re afraid they might tell you to move. That means you will have a hell of a lot of leverage to renegotiate with your landlord because they can’t just assume they can get someone else to move in for more. It also means you have a say in your building along with all your neighbors. That’s never been the case for market-rate tenants. You’ve never had any protections or any leverage. And you’ve never had any reason to fight for tenants rights. Now you do. And trust me, we need your help. First, the housing crisis demands that all renters work together right now. Over half of all renters in New York are considered rent-burdened, meaning you pay more than 30% of your income towards rent. That’s a big reason why there is a record 90,000 homeless New Yorkers across the state. Market-rate tenants are often times the most vulnerable to eviction and homelessness in the state. Second, the real estate industry is the most powerful special interest in New York and will do everything it can to stop Good Cause and the rest of the Universal Rent Control package. It has spent untold millions of dollars over decades to elect supportive politicians and block tenant protections. They spent millions in last year’s election and lost big for the first time. (A lot of the same developers also spent $80 million last year in California on TV ads confusing people about a rent control ballot vote that was popular with voters but lost). We can expect them to spend a lot of money and exert a lot of pressure from now until June. Third, there are a lot of politicians, even allegedly progressive Democrats — check up on your rep, trust me — who don’t support tenants. That might be because they are dependent on real estate money to win re-election or it might be because they are landlords themselves. But in a lot of cases, politicians simply don’t know much about housing policy (it’s confusing for everyone) and they don’t hear enough from stressed renters in their district. This year and this fight is different, though. There is a real chance to transform our housing market across the state for all renters. It’s also a real chance to shake up our political system that runs on real estate money. Those interests find and elect Republicans and conservative Democrats that end up blocking a lot of other progressive policies that most of us want. The good news is that we’ve already seen some big wins. The same people fighting for Good Cause right now — and the rest of the Universal Rent Control platform — are the same people who helped unseat real estate-backed Democrats and Republicans in last year’s election that gave the Democrats the biggest majority in the State Senate in a century. In their place, we got a number of new pro-tenant progressives elected to fight for all renters. One of those progressives is Julia Salazar, who introduced the Good Cause bill in the Senate. We’ve done a lot so far, but we have a long way to go until June. The real estate industry is bloodied, but looking to rebound. Some Democrats who supported tenants’ rights when Republicans were in charge don’t seem so sure now that Democrats are. And Governor Cuomo thinks he can bully everyone away from pro-tenant policies that scare his developer friends. You don’t need to know anything about rent regulations or housing policy to know that you’re paying too much money in rent. You don’t need to follow politics to know that the real estate industry has had too much power in this state. And you don’t need to be on the street protesting to make a real difference. If you’re a market-rate tenant, find your state senator or state assembly member. Call them. Write them an email. Send them a tweet. Make it known that maybe you haven’t been involved in tenants’ rights before, but you’re a market-rate tenant and you’re tired of paying so much and having so little protection. Good cause is your cause. Let’s make it happen. Now that the new legislative session has opened in Albany, the Housing Justice for All campaign has ratcheted up its fight for Universal Rent Control, a platform of bills that strengthen and expand tenants’ rights across the state. Even with united Democratic control for the first time in decades, there are a lot of structural obstacles in place that could derail the campaign over the next few months. Half of all renters in New York City and the vast majority in the state don’t have any protections and aren’t typically activated in the fight for tenants’ rights. The real estate industry has millions of dollars to spend on lobbying and media influencing. And many legislators, just like the average person, have a lot of outdated misconceptions about rent control. Changing the popular narrative of rent control is one of the most important, and hardest, challenges facing the Housing Justice for All campaign for Universal Rent Control. We only need to look to California, where the real estate lobby spent $80 million exploiting the same misconceptions to help defeat a rent control initiative called Prop 10. This week, help came in a big way from Oksana Mironov of Community Service Society of New York who published a timely report on rent control in New York City that should help every activist fighting for Universal Rent Control frame their arguments for the general public. It’s no secret that housing policy is a vast and confusing assortment of policies, agencies, acronyms, and formulas that scares off most people. Rent control (broadly used here to incorporate all rent regulations) is one of the most confusing aspects of this larger very confusing space. As the report points out, there is an inherent power imbalance between landlords and tenants. Landlords will always have more information, more control, more political access, and more money than a tenant, particularly in a stressed market (which NYC has always been and most cities have become). The marxist critique would go further and highlight the absurdity of tenants providing the capital that gives the landlord power over them. Rent control is the best way to offset this dynamic by securing real protections and power for tenants. One of the biggest achievements of the report is how clearly it explains how rent regulations do this and why it matters. Put simply, it shows that rent control is the best affordable housing policy we have (aside from expanding public housing). Rent control is a legal structure that helps cities and towns stay affordable without massive direct public subsidies. They restrict a landlord’s ability to raise rents, they guarantee a tenant’s right to a lease renewal, and they provide legal resources to combat abusive behavior. These tools together give tenants the power to negotiate with a landlord that they simply don’t have when they can’t easily move to a cheaper or better apartment or fear getting kicked out. It also has a larger impact on the health of a city. Rent control provides tenants and communities of color long-term protections against displacement in rapidly gentrifying neighborhoods. It offers more housing security for seniors, lower-income workers, and formerly homeless families than market rate housing. It also scares off speculators like private equity firms that raise property values, which gives non-profits, community land trusts, and other local ownership models the opportunity to own buildings. The report also goes through a brief but widely unknown history of rent control laws in the US and in New York particularly, showing how widespread it used to be and why it was so necessary as a policy. It’s worth reading, but the gist is simple: we’ve always been in a housing crisis because housing doesn’t function like a normal market. If the market was even somewhat designed to incentivize affordable housing, we’d have more affordable housing. But it isn’t and we don’t and never will by relying on it. Our solution now is to give billions of public dollars to private developers to subsidize “affordable housing units” that aren’t affordable, aren’t permanent, and aren’t built enough. The report makes the overwhelming argument that rent control is a much sounder policy for private affordable housing policy. Even though rent control works, it doesn’t take a housing nerd to see that current laws…don’t. They don’t “work” in a number of ways that the report covers well. It also shows how Universal Rent Control fixes them. First, rent control doesn’t protect enough tenants. Of 8 million renters in New York state, only 2.5 million have any type of protections. The vast majority of those folks live in NYC, but still less than half of all rental units are regulated. That doesn’t leave a lot of tenants protected or interested in fighting for them. Second, the current laws basically undermine the entire point of rent control. This is largely because the real estate lobby has effectively written these laws from the beginning. Their biggest problem is called vacancy decontrol, which allows units to exit the system and return to market rate when they reach $2733. This gives landlords a powerful motive to find ways to raise rents to that threshold. They have means through a series of loopholes that allow landlords to raise rents on existing tenants or in between leases. Throw in the fact that oversight is flimsy at the state and city level (one issue that URC needs to address better) and you’re left with a system that does not protect tenants as much as it suggests it would. Since 1994, almost 300,000 units have been deregulated. That offsets all of the units protected under Mayor de Blasio’s housing plan. The problem isn’t rent control as a concept, it’s rent control that is designed to fail slowly. Given this analysis, it’s no surprise that the report endorses the full platform of Universal Rent Control because it fixes these problems (ending vacancy decontrol, eliminating every loophole, expanding legal rights.) Most importantly, URC extends new protections to all renters, including market rate tenants, across the state. The final part of the report is the most important for housing activists because it debunks the lazy talking points against rent control. These will absolutely be used by the real estate lobby and will likely be repeated uncritically by the media. Much like the emerging debate over marginal tax rates, this is either because critics don’t actually understand how housing works or they are operating in bad faith. I encourage you to read the full section, but I’ll highlight one of the most important myths debunked in the report: rent control limits the supply of new construction, which raises rents for everybody. Ignore for a moment that new construction isn’t even covered under rent regulations (unless they receive tax subsidies) and focus on the logic. If rent control magically vanished, would rents go down and would construction boom? Well, no. We can look at examples like Cambridge, MA, where rent control vanished in 1994. Property values went up dramatically, and rents doubled in just three years. But there was and remains no construction boom that lowered rents. Rents continue to rise and displacement of low-income residents has increased, especially over the last five years, sparking housing protests from the Movement for Black Lives. Rents are going up in Cambridge and plenty of other places without rent control and construction isn’t keeping pace. So what is driving that? Scarcity of land, speculation, and zoning restrictions. Even without rent control, these factors still exist. You can debate solutions to those problems, but rent control doesn’t impact them and it’s absurd to suggest that it does. The only obvious way to protect tenants right now is capping rents. The only way to make it an effective policy is to have strong protections that reach all tenants. Now that Governor Cuomo has announced his intention to address “aggressive rent regulations reforms” during the budget process over the next few months, it is crunch time to make the case for strengthening and expanding rent protections. There are many obstacles ahead, including the governor. Every member of Housing Justice for All and every housing activist should read and share this report to make sure people know why we must pass Universal Rent Control. For many housing activists in New York, 2018 felt like the beginning of something big. The relentless scale of the affordable housing crisis finally reached a tipping point with the public. Hundreds of community groups on the ground around the state mobilized around this new energy and the result was stunning. The maturation of a truly state-wide tenant coalition in Housing Justice for All, the emergence of universal rent control as a viable policy platform, and the electoral victory of a new class of anti-real estate progressives have shaken up the political landscape in the state for the first time in generations. The task now is how to ensure that we translate the organizing energy of 2018 into legislative victories in 2019 — and beyond. The first and most obvious priority will be passing the package of bills that encompass universal rent control before the rent laws expire in June. The peculiar mechanics of power in Albany make this a challenging task even with unified Democratic control, but there is undoubtably a large energized base of activists and groups committed to the fight. There is a lot of work to be done, but I want to step back as the New Year starts and take a wider view of how housing activists should think about URC and its relationship to other issues in the progressive movement. This has implications for how we proceed with the URC battle in Albany over the next few months, but it matters for all progressive issues over the long run. Many other housing activists have pointed out that as much success as we’ve had with building a broad housing movement in 2018, we still experienced a lot of challenges around uniting different groups, agendas, and ideas within “housing”. We also struggled to bring in obvious potential allies like young market-rate tenants, construction labor, and even small working-class landlords. We need to understand why these challenges exist, because we need these groups to sustain progressive victories. The lack of inroads to some groups is probably in part due to the complexity of housing policy in general (and the difficulty of getting media to talk about it, before the election at least). Some is due to the perception that rent control won’t help market-rate tenants, or that it will slow down development and cost construction jobs. I’ve covered all of these issues in various blogs last year and I think we have some good ideas to address them. But I’ve had a nagging sense (I don’t have any data to be clear) that some people tune out because they don’t see how universal rent control fits into a larger effort to reform our society. They might think of it as a “one-off” issue rather than part of a larger effort. That’s a failure on our part. We should be able to reach these types of folks with the right message — if we can show how our housing goals are part of a single unifying theory of progressive reform in New York. What is that unifying theory? I read the same writers and thinkers as everyone else on this and I’m eager to hear what others think. But I believe, certainly as many others do, that the broad progressive theory to build a just society means fulfilling our individual roles as citizens before consumers, reestablishing democratic control rather than market control over our economy and politics, and investing in the public good over private profit. Pursuing policies around these broad goals are the best and most legitimate way to address the dual crises of wealth inequality and climate change. Feel free to disagree with that assessment or add/subtract to it. The progressive movement is full of important discussions about the role of personal and group identity in shaping our priorities (I think outsiders give these discussions a bad rap for the most part) and the housing movement is no different. The point is, whatever the movement defines or has defined as its central theory, we need to be clear and consistent with how we want our society organized and why we think that offers a more perfect future for America. I’m not sure we’re doing enough of that, certainly not in the URC fight. It’s hard to convey this on signs and buttons during actions, so it is important that we talk about the organizing theory in other places and on other platforms where we can be more in-depth. Whether its more op-eds or (definitely) more video or attending more local meetings, we need more people to hear that message directly. Groups like the DSA, New York Communities for Change, and Make the Road Action are working on this already, so helping these organizations expand their efforts should be a big focus for housing progressives. Along those lines, here are three Big Priorities that the progressive housing movement should work hard on as we ramp up the URC fight in the coming months. If we keep these ideas in mind as we talk to other folks in housing and to anyone in general as we go, we should be able to translate the energy of this coalition into a larger transformative progressive movement. Mayor de Blasio’s recent year-end review of his housing policy is a good symbol of the problem we face. He continues to view affordable housing, public housing, and homelessness as three separate issues. He’s not alone. Housing policy and advocacy has always been a balkanized mess with groups often competing for very limited funding and attention. There are groups that should seemingly be aligned because they all work on low-income housing issues that aren’t in reality because they have deep divisions over things like prioritizing homeownership over renting. Other examples include homelessness advocates sparing with public housing advocates over prioritizing available NYCHA units. Affordable housing advocates spar about definitions of affordable and whether to prioritize for-profit, not-for-profit, or public development. The list goes on. Some of these divisions are natural and healthy because housing is a vast policy landscape that has multiple potential outcomes of value. But many of them are the unhealthy result of a zero-sum funding game dictated by the narrow ideology of prioritizing the private market above all else. That has obviously worked — because it is providing billions of dollars to private developers, but it has not worked as a housing policy. (The term “affordable housing” is increasingly meaningless because of this too.) That’s what happens when the housing world is as divided as it currently is. This dynamic must change. It starts by making housing a right the central goal of all housing groups. The current policy landscape is narrow and static, which blocks out ideas and voices that we need to hear. To truly expand policy thinking on housing, the housing world must become united around a single political goal of providing affordable, adequate, and available housing to all residents of New York. By necessity, such a vast goal will need to draw from all corners of the political spectrum. Homeownership and rental options must be expanded. Public housing and private development must be encouraged equally. Land-use and building codes must be reimagined. All ideas must be on the table. This won’t magically cure real policy disagreements or funding problems, but it will break the political status quo, which has paralyzed both discussions. Thinking about affordable housing, supportive housing, public housing, and homelessness as separate issues has trapped many dedicated housing groups, some well-meaning non profit developers, and a few elected leaders in a cage match over dwindling funds and ideas. Housing as a right as a political goal will encourage new voices, new ideas, and new alliances. The Housing Justice for All coalition has done a remarkable job of building a wide coalition because it has committed to this goal already, but we need to reach out to other groups like NYCHA residents, homelessness groups, low-income homeownership groups, small landlords, market-rate tenants, and construction trade groups to form a single united housing as a right movement. There are many knowledgable and creative housing groups that could be useful parts of the coalition that are fence-sitting because of reasonable political calculations around funding and relationships. Change the politics, and those calculations change. This is the kind of bold reset that the affordable housing crisis is demanding of our politics and we have the opportunity to seize it this year — if we act boldly. I studied Urban Planning in grad school because I believe the city is humanity’s best idea. Humans are social, collaborative, and competitive — concentrating them in one place brings out the best of those qualities in us and drives progressive as a civilization. — if we manage it well. Progressive urbanism offers that chance. Cities also best represent the unique possibilities of the American character. You can find community. You can find opportunity. You can find purpose. That’s why they are magnets to immigrants, entrepreneurs, artists, and exiles. Contrary to what others say, cities are where the real America exists and where its future lies. That future is diverse, dense, and digital. America is already an urban country and will only grow more so in the 21st century. But if 21st century America is going to work, we need to make its cities work. And they aren’t working right now. Communities are under fire. Opportunity is out of reach. Purpose is illusive. That’s especially true in NYC, which is one of the most economically and racially stratified cities in North America. The problem is America’s politics are anti-urban. The Constitution doesn’t recognize cities. The Electoral College undervalues them. The federal government has favored (and subsidized) the rural and suburban parts of the country for most of the 20th century at the expense of them. The racist anti-urban ideology baked into 20th century American politics is a large reason for the inequality crisis and climate crisis shaking our country apart, but cities don’t have the political power to fix it. It’s time for the politics to catch up. A progressive urbanist agenda must be the core of 21st American politics. Housing progressives must argue that living in cities is how we live well together and how we best solve the problems facing our country and planet. We must explain why the advantages of urban life — the diverse, dense, and digital I mentioned earlier — are built-in ways to address inequality and climate change quickly and sustainably. The housing movement must be a foundational partner in building the popular movement to reform our political system around cities. That means fighting for things as big as structural changes in the US Senate and House or changing housing and transportation policy at the federal level. And it means fighting for smaller immediate things like making sure the 2020 Censuscounts urban populations accurately and without racial animus baked in. Cities are where the country is already moving, literally, and where the political future lies. Recognizing this and empowering cities will create thousands of democratic laboratories designed to fight inequality and climate change from the bottom up. But only if they are midwifed with progressive values. Guaranteed affordable housing is the lynchpin of a larger set of issues that include improving wages and labor rights, recommitting to public education, creating universal healthcare, deconstructing systemic racism, and pursuing environmental justice and sustainability, among many others. Progressive urbanism fits well into any potential organizing theory of progressive principles. It has to be a core tenant of the housing movement and it has to be the core message to bring in other non-housing groups to the cause. It’s no coincidence that housing activists fighting for URC are also involved in the Anti-Amazon HQ2 protests in NYC. They are the same fight in the end. To really end the housing crisis, we must tackle the crisis of late capitalism that Amazon represents. Capitalism has stopped working the way Americans have been raised to imagine it. Only the most ideologically blinded and deeply compromised partisans can look at the state of our economy and pretend otherwise. Most industries, especially finance, energy, telecoms, and pharmaceuticals have concentrated around a few dominant players who control their regulatory regimes at the expense of employees and consumers. On top of this, the tech boom, despite the (now cresting) fascination with startups, has led to an unprecedented concentration of economic and cultural power in a few firms, industries, and geographies. This has massive implications for the health of our economy and society, which we’ve only starting to reckon with properly. Getting cheap crap as consumers should not outweigh the cost to us as employees and citizens. That tradeoff has been toxic. American entrepreneurship has plummeted. Wages for the top earners have exploded while wages for the vast majority of workers have stagnated — despite nine years of economic growth. Debts of any kind are skyrocketing to fill the gap. The chance to enter the middle class has all but vanished for many while the chance to remain there is diminishing for a huge swath of the country. This is late capitalism. The commodification of housing is just another byproduct of late capitalism’s unchallenged thrust towards commodifying every aspect of our lives that undermines our civic and ecological lives. That is what is driving the rise of rents, displacement, and eviction. It explains part of the increase in climate disasters and is certainly a major factor in the failure to respond to them. In New York at least, URC has a legitimate shot at clawing back democratic power over housing policy from the real estate industry for the first time in generations. But it is not enough to stop there. We must crawl back democratic control of the economy overall. URC should be the beginning of the larger movement to do so. That means the housing movement must align with worker movements and progressive elected officials in their efforts to break up monopolies and oligarchies in every industry, but particularly in tech and finance. Solidarity is the cornerstone of the housing movement, but we need that message to get out to the general public and to other potential allies: Passing universal rent control will not be enough to solve inequality. Because of that, even if we do pass URC, the coalition that made it possible won’t be going anywhere. In the early 20th century, when the progressive movement first emerged, corporate power and capitalism itself were contested in the market place of ideas in America. Even Republicans like President Roosevelt warned against their threat to democracy. That battle came to a head during the Great Depression when the other President Roosevelt famously said his New Deal was an attempt to save capitalism from itself. For a time, for America as a whole, it did that. The last 40 years have unravelled it. It’s clear that we need a massive, New Deal-level reboot in this country. That doesn’t just mean a Green New Deal. And it doesn’t just mean housing as a right. It means rebooting every corner of our politics and our economy. As housing progressives fight for universal rent control in New York, we must step up and make sure people know that’s what we’re all fighting for. Yesterday Mayor de Blasio announced an updated plan to fix the crumbling public housing stock in NYC before it falls into federal receivership — and even more uncertainty. The plan calls for selling air rights, allowing developers to build on NYCHA land, and most radically of all, transferring 1/3 of all NYCHA homes to private manage. If all goes according to the plan, these programs will still only account for 75% of the $32 billion in needed upgrades for NYCHA, leaving the remaining funding in the hands of an uncommitted Governor Cuomo and an openly hostile federal administration. It also doesn’t provide any new housing opportunities for the 360,000 New York families on the waiting list for NYCHA or Section 8 vouchers or the more than 60,000 homeless New Yorkers. I don’t envy the Mayor’s position. This is his best option to find the significant cash infusion for upgrades to a vast system. NYCHA manages 176,000 homes across 2,400 buildings. Almost half of NYCHA developments are 50 years or older. Decades of underinvestment from the federal government (and years of mismanagement at NYCHA) has compounded to put many buildings on the brink of permanent decline and eventual condemnation. Over 400,000 New Yorkers live in NYCHA and deserve dramatic and fast solutions. The fact that this is the best option is not on the Mayor. But let’s be clear what this plan represents: this is an admission that the idea of public housing in the US is over — from a progressive mayor in a progressive city with a long history of successful stewardship of public housing. There are 1.3 million publicly owned homes in the US, but NYCHA is by far the largest concentration of them. For 80 years, it has stood out as a well managed bastion of affordable housing, in sharp contrast to other cities that never had the political support to properly invest in a system. For every Pruitt-Igoe or Cabrini-Green in another city, there is a Queensbridge or Williamsburg Houses here. These developments aren’t perfect, but they are providing affordable homes and stable communities for thousands of New Yorkers. NYCHA showed that public housing worked. The real story of NYCHA is how resilient it has proved to be despite a hostile federal government and indifferent public that have betrayed it at every corner over the last forty years. Just since 2001, the federal government has cut over $3 billion in operational funding. It’s only recently that NYCHA has started to fracture and it’s miraculous that it endured as well as it did under the circumstances. If after all of that, we’re throwing in the towel on NYCHA now, we’re throwing it in everywhere. At a time when virtually the entire country is feeling the pain of the affordable housing crisis, this is the exact opposite of what we need to do. One out of three American households (38 million) are cost burdened. Half of all renters are cost burdened (which has doubled over the last 50 years) and a quarter are severely burdened. Since 2000, the number of Americans living in poverty has increased by 28% to 12.8 million. In 2016 alone, 1.4 million people (including 175,000 families with children) were homeless at some point during the year. In New York City, it’s even worse. 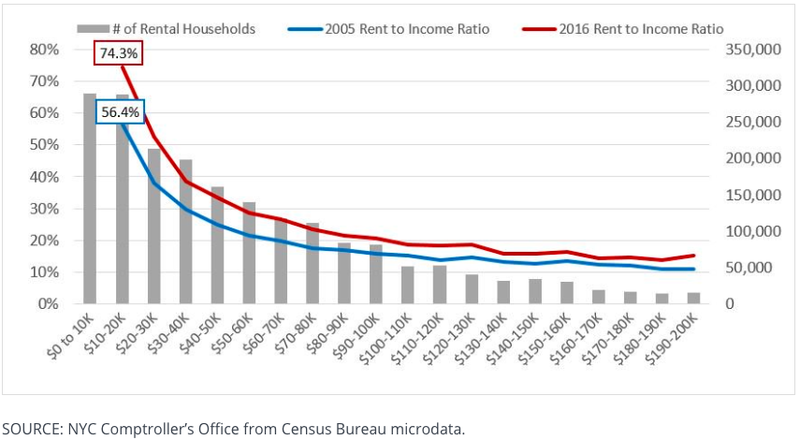 Half of all renters in NYC are rent burdened, including virtually all low-income households. Homelessness is at record numbers. Displacement of low-income communities is rampant. What is truly scary about all of this is that it is happening during one of the longest periods of economic growth in our history. At precisely the time where we need bold, transformative federal leadership on housing, when we need more public housing, the federal government under the Trump administration is retreating even further. Last month, HUD Secretary Carson sent a letter to public housing authorities outlining HUD’s plan to dramatically reduce the stock of public housing in the US. Housing advocates fear that next year they will see severe budget cuts to public housing and other housing programs. It’s not enough to blame President Trump or Republicans. The Democratic Party doesn’t support public housing either. Despite champions like Rep. Barbara Lee, Nydia Velazquez, or Hakeem Jeffries, the party overall, and particularly during the Obama Administration, has actively supported privatization of public housing which demonstrably leads to a reduction of affordable housing. The Democratic Party has never made public housing the priority it should be and millions of Americans, not just NYCHA residents, have suffered as a consequence. Instead, both parties have embraced subsidizing homeownership and incentivizing the private market to build affordable housing units for decades. The result of this bipartisanship is skyrocketing home and rental prices and millions of missing affordable homes. The mayor’s plan in part reflects this ugly reality. The central component of the plan is the expansion of the controversial Obama-era Rental Assistance Demonstration (RAD) program. The mayor proposes transferring 62,000 homes — one third of the system — into private management supported by Section 8 vouchers. NYCHA would still own the properties, but private developers would be able to leverage private capital markets to make repairs and then collect rents on a 99-year lease. The mayor estimates that this process (which includes non-RAD programs as well) would generate $12.8b in repairs. RAD has become liberal’s “best idea” for a long-term solution for public housing. That’s understandable. Given the way public housing is framed nationally, it represents the only idea to raise large amounts of capital for public housing right now. Many cities, like San Francisco, have or are in the process of converting their entire public housing stock into the RAD program. In NYC, developments have already been converted. The biggest so far, Ocean Bay in the Rockaways, has been viewed as validation for the program. The infusion of capital has led to renovations for all apartments and a palpable improvement in the quality of life for residents. This is of course welcome for the New Yorkers in these buildings. But what Ocean Bay proves is, wait for it, the quality of buildings and the quality of life for residents improves when you invest money in them. There is nothing intrinsically better about private management, other than there is political support to subsidize it. NYCHA used to be a model of property management because it used to have enough money to do it well too. In the short term, RAD-fueled private management might be a godsend to residents compared to a slowing and staggering NYCHA. But this is an illusion. The reality is, housing low-income residents is massively expensive, especially in older large-scale buildings. Adding the need for private firms to profit only increases the cost to the public in the long run. At some point in the not too distant future, these private firms will no doubt come back to the table looking for more money. Roofs leak, elevators breakdown, boilers need replacing and investors change their expectations. Incomes aren’t likely to increase for these residents, especially as the population ages, to cover higher costs. The cost of climate change (either adaption or mitigation) will eventually materialize and will likely be prohibitive given the location of so many developments near water. No amount of current tenant protections within RAD will stop the need to either raise rents or increase public subsidies to keep these private firms in business. No institution other than the federal government can handle the nation’s housing needs now or tomorrow. It is simply more efficient and more equitable to build, own, and manage these homes publicly through federal funding. It is bad enough that our society can’t produce economic prosperity and security for all of its citizens, but it is especially perverse to allow private interests to profit from the housing of the poor and working class, especially when it is clear that the private market is utterly incapable of meeting the affordable housing needs of our nation. You might argue that the public shouldn’t be concerned about doing this, but you would be wrong. Unless our economy is rebooted to spread wealth and security to everybody, the increasing winner-take all society we live in will cease to have any legitimacy for the poor and working class (to the extent that it has any left). At its mildest the resulting pain will cause an exorbitant cost in social services and lost economic productivity. At its most severe, it will cause mass unrest and social revolution. The Mayor has many flaws, but he can not carry all of the weight for NYCHA’s misfortunes. We’ll find out tomorrow in court if the Mayor’s plan is enough to avoid federal receivership. Surly the federal government doesn’t want to take responsibility for NYCHA. That’s not good enough. We must demand that the federal government provide the funding necessary not only to upgrade existing NYCHA properties, but to expand public housing to guarantee that all Americans have a safe, clean affordable home where ever they need it. But until enough Democrats wake up about the housing crisis, we’ll keep seeing the steady, miserable erosion of public housing in the US. On Thursday, City Comptroller Scott Stringer published a startling report on the affordable housing crisis in New York City that shows a significant gap between the housing needs of extremely low-income New Yorkers and the targets of Mayor de Blasio’s Housing New York 2.0 Plan. The report also proposes a couple of intriguing progressive ways to address it. That’s a daunting amount of need, but the mayor’s housing plan has barely attempted to target it. The plan, which Stringer acknowledged was the most ambitious since the Koch Administration, calls for the preservation or construction of 300,000 affordable housing units by 2026 at a cost of $83 billion (up from 200,000 and $43 billion when the plan was introduced in 2014). To date, 75,285 units have been preserved and 34,482 new units have been constructed, which puts the plan at just over one-third of the way completed. However, as you can see from Chart 3, only 25% of the 300,000 units have been allotted for very-low to extremely-low income households, despite those households representing 88% of the most severely distressed in the city. To put it in context, even if the plan is successful, it will have built 75,000 units to service a population of 515,000 households. Groups like Real Affordability for All have criticized the mayor’s housing plan for ignoring low-income households before, but Comptroller Stringer’s report is less a criticism and more of a suggested pivot. It includes three proposals for the city to realign the existing housing plan towards these low-income households. First, it suggests committing the remaining target of 85,000 new construction units to extremely-low income households. Second, it suggests raising the percentage of units set aside for homeless families from 5% to 15%. Third, and most radically, it proposes a new operating subsidy for landlords for preserved units that go to extremely low-income households to help landlords. Those won’t be cheap. According to the report, targeting extremely-low income households for the remaining 85,000 new construction units would require an additional $370 million per year, while the operating subsidy would be $125 million per year. Both numbers deserve more scrutiny, particularly the operating subsidy, which has been suggested on a larger scale by some notable presidential hopefuls but has come under harsh criticism. For progressives, the most interesting aspect of the report is how it proposes creating new sources of revenue to cover the costs. Comptroller Stringer first turns to his long-held support for creating a Land Bank to give city-owned vacant lots to non-profit developers and community land trusts, vastly reducing the cost of new construction. His office estimates that the 1,000 plus current inventory of vacant lots could produce close to 40,000 units. These units would have the benefit of being permanently affordable and locally-owned. More significantly, he proposes a progressive change in how to tax home purchases. Currently, a potential buyer who pays in cash pays less tax than a buyer financing through a mortgage. This quirk exists because the city and state tax the purchase price through the Real Property Transfer Tax (RPTT) and the mortgage through the Mortgage Recording Tax (MRT), which effectively double-taxes people who can’t afford to pay in cash. This is backwards for two reasons. Obviously it makes it even more expensive for middle class and working class families to buy homes in the city. It also grossly under taxes high-dollar cash transactions made almost exclusively by anonymous high-wealth individuals, foreign investors, and private equity firms. The report highlights the fact that in 2016, 80% of Manhattan condo purchases over $5 million were all cash. The report suggests eliminating the MRT altogether and installing a new, progressive rate schedule for the RPTT, as seen in Chart 4. Although still relatively low compared to other global cities like London or Singapore, the tax could potentially create $400 million in new revenue (while reducing the tax burden on a middle-class buyer). Even if a higher tax lowers the volume of sales, scaring off the speculative frenzy enveloping the city would be welcome on its own. Comptroller Stringer suggests that this tax would more than cover the cost of the report’s proposals. He also suggests that if enacted, the proposal would likely reduce spending in other areas, particularly around homeless services. That may be the case, but the political path forward remains murky. Like a lot of progressives in the city, Comptroller Stringer is banking on the new Democrat majority in Albany being open to his proposals, but that line is long and loud. The City Council has been sitting on a land bank bill for several years and might not be eager to support a potential rival for 2021 (He notably doged any discussion about running for mayor). Most importantly, Mayor de Blasio is never eager for outside input into his administration, let alone on his signature policy. Regardless of the politics, this report outlines a city in dire need for bolder action to address the affordable housing crisis while there is still time. The city’s government has become over reliant on skyrocketing real estate prices fueled by faceless investors and foreign entities while ignoring the lived experience of everyday struggling New Yorkers. That might be easier to ignore when the economy is growing overall, but it will be impossible to forgive when it inevitably goes in the other direction. Voters in New York have spoken, and they want relief from the affordable housing crisis. Last week, they handed control of state government over completely to Democrats, most of who ran on progressive, pro-tenant platforms. Particularly in the state senate, which flipped for the first time in years, many first-time candidates beat pro-developer incumbents by rejecting real estate money and instead embracing the call for universal rent control. This doesn’t mean that voters will get relief, however. With current rent regulation laws set to expire early next year, voters have set up an unprecedented fight between progressive housing groups and real estate interests. It will be a brutal fight. For proof of this, housing advocates in New York need only to look at California. California and New York have extremely different political contexts, so making direct comparisons has limited value. However, there are several important lessons that New York housing advocates can take away from Prop 10’s defeat. Prop 10 didn’t stand a chance as a ballot initiative, partly because of the money aligned against it, but equally because it was confusing. It was not a “Yes/No” vote on rent control. The language of the proposal was about repealing the state’s Costa-Hawkins Rental Housing Act that prevented local cities or towns from enacting any kind of new residential rent control. That left a lot undefined for voters. They were asked to vote on repealing something—and many did not have a specific sense of what repealing it would mean for their city or town, or for them personally as renters or homeowners. Even with millions of dollars from tenant groups and the AIDS Healthcare Foundation, this dynamic made it easy for well-funded real estate interests to fill in the gaps and define it how they wanted to. This clearly cost Prop 10 a lot of should-be voters. That is less of an issue with Universal Rent Control in New York. Although the scope of the proposal is still being worked out, the broad goals are clear and who benefits is clear: every rental unit in New York state will become protected (it’s less than half now.) Every loophole that allows landlords to raise rents, evict tenants, or deregulate units will be removed. Every renter will have new eviction and harassment protection. Though URC is easier to understand than Prop 10, it is important that activists and progressive legislators work together quickly to define the specific proposals around universal rent control before real estate interests start flooding the air with advertisements against it. This will make it easier to rally the broad spectrum of renters that stand to benefit from the plan, particularly market rate tenants that must be brought on board to pressure other legislators in the Democratic Party. Pressure is key. California, just like New York, is blue, but that hasn’t translated into progressive housing legislation. This pattern cost them with Prop 10, which first died in a Democrat-controlled committee before reappearing as a ballot initiative. There are not enough Democrats in office in California with the stomach to challenge the real estate industry and their wealthy homeowner constituents to enact the type of far-reaching reforms necessary to fight the housing crisis. That had been the case in New York before the November election, but now Democrats control all three branches of elected government and have a rare window to challenge the status quo. Democrats have dominated the Assembly for years, but the big difference is the Senate, where Democrats took control for just the third time in more than fifty years, fueled by an aggressively pro-tenant wave of first-time candidates. The wildcard will be New York’s Governor Cuomo, who ran to the left because he was pushed there by a spirited challenger. He has been a big friend of the real estate lobby for as long as he’s been in politics. He is now in uncharted territory, but it appears that he can no longer hide behind New York’s long standing closed-door dealdynamic. Unlike in California, having complete control of state government should mean that universal rent control would get considerable attention from legislators. The severity of the crisis along with the significant shift away from real estate money in elections should keep pressure on the Governor and other members of the Democratic Party who might otherwise be wary of angering the real estate industry. Defining the proposals for URC quickly and keeping activist groups engaged throughout the process will hopefully be enough to turn the electoral momentum into firm legislative action. In California, the real estate lobby spent the majority of its money on television ads harping on the classic Econ 101 arguments against rent control. These arguments are not as strong as they appear. The reality of the housing market has always been more complicated than simplistic models suggest and it is critical to push back on them. First, studies that claim rent control harms the creation of new housing or the quality of existing housing fail to properly account for the more demonstrable variables that limit supply in tight and densely populated markets like New York, San Francisco, or Los Angeles like natural geographic barriers, social preferences of land use, the limited extent of transportation networks, and even a desire to limit competition among developers. Second, they tend to underplay how decades of (federal and local) government policies have privileged real estate and empowered financial markets to commodify housing. The housing market ‘s priority is enriching investors instead of meeting the overwhelming demand for affordable shelter. That explains how the Low Income Housing Coalition estimates that the U.S. is missing 7.2 million affordable housing units, yet 250,000 units sit empty in New York City alone. Third, they ignore the bigger problem with the housing market: rent-seeking behavior. There’s only so much land, particularly in desirable markets like New York where it’s value has skyrocketed over the last 20 years as more people and firms want to move here (for better or worse). This has made city landowners incredibly wealthy. The pay-to-play nature of our political process means that they also have a disproportionate amount of power over things that impact the housing market like property taxes, zoning, and affordable housing policy. This almost always harms the public while driving up property values. It helps explain everything from why so many commercial spaces are empty to why it costs so much to build new affordable housing and homeless shelters. When we acknowledge that the housing market in reality encourages rent-seeking behavior and show how much it corrupts public policy, rent control becomes a legitimate and necessary intervention to empower tenants and the broader public against economic and political exploitation. Prop 10 was ultimately a bad presentation of a compelling and urgent public policy choice. Even if real estate interests hadn’t spent so much money distorting it, it failed to capture the general public’s attention or imagination. That doesn’t have to be the case in New York, where Universal Rent Control has already done that for many renters and voters. Now that it has a shot in Albany, California’s experience can help it get over the finish line. Election Day is here and, depending on your perspective and persuasion, our country will be saved or doomed. Maybe both, maybe neither. On a personal note, I’m proud of playing a small part in a cycle that has seen the emergence of a progressive left as a growing electoral force. In the spring, I started hearing about a young woman running for Congress in the Bronx, and it was a single tweet from her talking about housing as a right that hooked me. It was something I believed, but never thought would become an actual rallying cry in American politics. Since then, over the last 6 months, I’ve knocked on countless doors across 4 of the 5 boroughs (sorry Staten Island) for Alex Ocasio-Cortez, Julia Salazar, and for many other progressive candidates that believe the same thing. I’ve met amazing, committed activists of all ages and backgrounds that have come together to talk about important issues, promote great ideas, and elect amazing candidates. For a housing nerd like me, I’ve especially been inspired by the community of housing organizers that I’ve come to know. There were a lot of important issues that got people fired up this cycle. However, universal rent control is one of the most exciting movements that has started to come into focus. It is an opportunity to radically change the political landscape in Albany, but has a long way to go, even if things go right on Election Day. Everybody complains about how corrupt Albany is, but it really is, and real estate is the reason why. REBNY (The Real Estate Board of New York), one of the major political arms of big real estate developers, spends like crazy every election cycle on politicians from both parties and gets its members to spend even more. This means that renters, the homeless, small landlords, and low-income communities across the state are blocked from expressing meaningful political power. There are just enough politicians speaking for these groups to give the appearance of a fighting chance, but the supremacy of the status quo is undeniable. This election cycle is challenging the status quo. During the Democratic primary in September, pro-tenant progressive candidates beat a slate of establishment Democrats, including 6 out of the 8 state senators of the now defunct Independent Democratic Conference (IDC). These candidates (and even candidates from other parties) all ran on a platform that rejected real estate money and most embraced universal rent control. These candidates are pro-tenant, but as importantly they are pro-democracy. By taking rightful power from a tiny group of wealthy developers and giving it back to the broader population of New Yorkers, we can start to solve the deeper political crisis in our state that is fueling the housing crisis. URC is the first and biggest opportunity to turn this momentum into law, just as our current rent regulation laws are set to expire in 2019. Universal rent control will apply to every renter in New York state and is designed to block extreme rent increases, prevent unfair evictions, and eliminate perverse incentives to kick out tenants. This is the only way, right now, to protect tenants from increasing rent pressure. When half of all rentersare already burdened, help is needed fast. URC will improve on the existing rent regulation protections in two critical ways. First, it will apply to all renters. Current laws apply to less than half of all renters in NYC and a tiny fraction outside of the city, so the benefits are not widely shared and understood. Second, it will remove the many loopholesthat allow landlords to raise rents in regulated units and to remove units from regulations altogether. By closing loopholes and spreading protection to all renters, the housing market in New York will change dramatically. Every renter will gain meaningful protections against the type of stress and abuse that have become typical for too many. It is a blunt tool for sure, and it must be part of other large reforms in land use policy, property tax law, and occupancy requirements, among others. But on its own, right now, it will help protect tenants from the onslaught of the housing crisis and show them that political change is possible if they remain united. 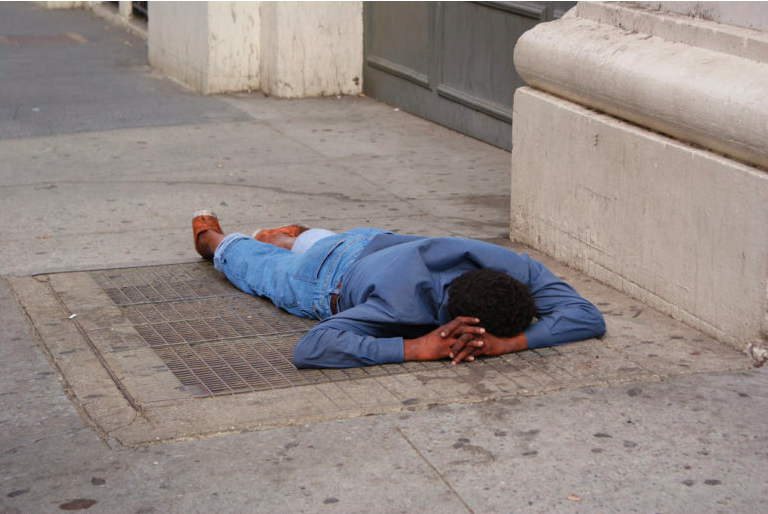 There are a record 89,000 homeless New Yorkers across the state, 62,000 of them are in NYC. A large portion of them are families. Many of them are veterans. Lots of these adults are working. This is happening while our economy has been “booming” for ten years. This is a moral failure. If that’s not enough for you, then it’s also a policy failure. The number one reason for the spike of homelessness is a lack of affordable housing. People can’t afford to stay in their homes and can’t afford to move and/or secure new housing. New York spends millions of dollars trying to fill the gap with shelters and supportive housing, but we should be working on keeping people in their homes to begin with. Eviction prevention is a proven method to improve outcomes for housing insecure individuals and is a substantially more cost effective policy for taxpayers. URC includes the expansion of eviction protections currently underway in NYC like right-to-counsel and anti-harassment measures, but it can also include a streamlined system for short-term rental assistance before eviction proceedings start. Many of the existing rental assistance programs at the state level are difficult to navigate and apply to a narrow pool of applicants. Federal programs are even worse. Simplifying and expanding these programs under a URC platform will be a net benefit for these New Yorkers and for the state. Ending homelessness is a choice and one that we can do with a relatively small operational lift. URC is a drastic intervention in the housing market and flies in the face of every 101 econ class lesson, but it is also necessary and justified because the housing market in New York, and especially NYC, has always been broken. It might be counterintuitive, but URC can actually fix this. In a classic market simulation, perfect competition between rational actors creates an equilibrium between supply and demand cancelling out profits. No capitalist actually wants that and, historically, capitalists have worked very hard to prevent that from happening. Our current form of late capitalism has perfected this. This is especially true in the housing market. Simply put, the market doesn’t build enough quality affordable housing because it isn’t interested in doing so. It only does so with expensive public subsidies. Every activist agrees that we need a greater supply of housing, but our reliance on this method has produced few affordable units relative to need at truly astronomical per unit costs. The only winners here are developers. As much as developers complain about it, the cost and complexity of building in NYC benefits them because it prevents new developers (big or small) from entering and competing. A restricted supply and complex regulatory landscape raises profits and limits competition, leaving a small, wealthy community with a lot of power and incentive to maintain the status quo, which is what REBNY does well. This hardly makes for a healthy market. Tenants don’t have corresponding market power because they don’t have the power to “vote with their feet” to change this status quo. Without a “pure” market (never gonna happen) to even the playing field for tenants, the argument for URC becomes obvious. URC would remove the worst predatory actors from the market by restricting rents, but if it includes complimentary reforms that create more competition, (things like reforming occupancy laws, zoning restrictions, property tax law, but there are many ideas to pull from) it could spur a renaissance in construction practices and productivity that have been slow to materialize under the current status quo. We need to encourage more innovation and competition within the development community to add housing more responsive to the public’s changing needs. This includes more use-specific options for seniors, special needs individuals, families, and young singles, as well as incorporating more sustainable construction and energy-use methods. URC is a rejection of the current structure of the housing market, but that doesn’t mean it can’t be a vehicle for innovation. By establishing Housing for All as the goal of the housing market, URC is challenging who gets to compete and what ideas get to compete. The post-recession emergence of foreign and institutional investors at the high-end and the growth of house flipping platforms at the low-end have created unprecedented competition for real estate in many corners of the state. These forces have particularly targeted low-income communities of color, triggering levels of displacement that we are only just starting to understand. It’s no surprise that large scale investors have turned to single-family properties and small multi-family portfolios in cities like NYC. They are safe, highly privileged assets in American tax law and are the benefactor of the larger trend of people preferring to live in urban environments. High debt levels and stagnant wages have further increased the demand of rental housing for younger and older Americans. The prospect of weakening already leaky rent regulation laws only creates more interest in these buildings. URC will obviously change the calculation on rising rents. This will in turn have a potential impact on the attractiveness of housing as an investment asset overall. Removing the speculative value of housing will lower the costs not only for renters, but for local landlords and community groups to take on ownership. If URC gets passed, making it easier for these types of local actors to own the land and buildings in their community will prevent displacement and retain prosperity within these communities. The same coalition could support alternative equity models like community land trusts to further empower community-led ownership. I am too burned from 2016 to want to hear, let alone, make predictions about Election Day. But at the local level in New York, there is a real chance that progressive change can take hold in Albany after the election. If the Senate flips, there is a credible chance to enact universal rent control. But the fight will be brutal. REBNY, RSA, and high-influence developers were clearly caught off guard by the rebellion in the primaries, but they have considerable structural advantages in Albany. Governor Cuomo will be a particularly vexing wild card. Whatever happens on Election Day (I may update this as needed) I hope that voters, long-time or first-time, continue to stay involved with other activist groups. The coalition for universal rent control is still in its early stages, but the housing rights and tenants rights communities have been around for a long time. Channeling the experience of these groups with the energy of newly engaged local voters could produce some truly remarkable change in 2019. Here’s hoping. Universal rent control (URC) at this point is a fairly broad term, but in the context of New York City, it’s essentially a series of policy proposals that aim to fix the many flaws in current rent regulation laws (which, for the purpose of this blog, includes rent stabilization and rent control policies, but not Section 8 or public housing policies). These laws only apply to some, mostly older buildings and have tons of loopholes that allow units to be deregulated. Universal rent control would expand protections to every rental unit and remove those loopholes. It would “distort” the housing market, but, as we’ll discuss, it could also fix the bigger issue distorting it. The URC fight has been embraced by a group of insurgent state candidates on the left and has the support of many leading activist groups in the city and upstate (full disclosure: I volunteer for the Ocasio-Cortez and Salazar campaigns). With these laws up for renewal in Albany next year, this framing marks an important shift away from previous (mostly losing) battles over the issue and is quite timely. What really excites me about URC goes to the second question about rent control and markets. URC would of course impact rent costs, but what it could do to land costs is potentially even more important. Rent regulations are one of economists’ favorite “gotcha” concepts because they go against every basic market theory that says the highest and best use of an asset is intrinsically the best for a society. The scale of displacement in NYC puts that concept to bed. New York City has been a vibrant place historically because it has been possible to be poor and working class here. Without protecting these New Yorkers, that vibrancy will end. Rent regulations limit how much a landlord can charge for an apartment and how much they can increase rent over time. They are often blamed for raising rents and/or lowering supply in cities overall but these arguments vastly overstate their impact compared to more pressing issues like rising construction costs and, especially, skyrocketing land costs. Land costs are the key here. Economists argue that rent regulations create terrible inefficiencies in markets, but they should also be worried about rent-seeking behavior doing the same. An “economic rent” is the extra wealth earned from an asset used in its present form (not to be confused with the “rent” we pay each month) and rent-seeking is the attempt to manipulate circumstances to increase that rent without creating new value from it. Owning land, particularly in a city like NYC, is a “gotcha” example of rent-seeking behavior run amok. To be clear, current rent regulation laws in NYC aren’t designed to challenge rent-seeking behavior. Given the patchwork history of legislation and the oafishly corrupt nature of Albany politics, they don’t have a cohesive goal, let alone design. They limit the rent increase for some renters to some degree, but they ignore or create a host of other problems. Universal rent control does challenge rent-seeking behavior. Doing so could fundamentally change the economic calculus in NYC real estate and the potential value of land by making housing more of a utility than a commodity. Keep in mind URC is still just a series of broadly defined proposals, but conceptually it offers a glimpse at a more equitable and democratic future. To start with, less than half of all rental units in NYC fall under current rent regulations, which severely limits the political power of renters as a united front against the well funded and organized real estate industry. There is little incentive for market-rate tenants to cooperate with rent-regulated tenants. This leaves a smaller, poorer, and older population to fight for tenants’ rights for everyone. URC calls for extending rent regulations to all rental units in New York, which would radically change this political dynamic. The sheer number of renters as a political constituency could offset the financial power of the real estate industry in Albany and create more protections and, most importantly, real innovation in affordable housing. Another problem with current laws is loopholes - too many perverse means and motive for landlords to force rent increases and/or to force out tenants. The most disastrous policy, vacancy decontrol, allows apartments to leave rent regulations altogether when they hit $2,733/m. The city lost an estimated 147,500 affordable units over the last 24 years to this alone. URC would end vacancy decontrol and remove loopholes around vacancy bonuses, preferential rents, and major capital improvements. In effect, they would permanently prevent the speculative (and cynical) calculations that some landlords make to get passed regulations. It’s not that landlords can’t still make a profit, but there would be a cap. This would suppress the speculative value of land across the city. It would certainly scare off the worst actors in the market and likely create space for local landlords, non-profits, and models like community land trusts to enter the market instead. This would be a net positive for NYC. Rent regulations attempt to maximize the value of shelter over financial value, which is a foreign concept at this stage of late capitalism America. Most economists think that’s a mistake, but keeping wealth and power in local communities rather than private equity firms or foreign investors is more democratic, better for the economy, and better for the life of the city in the long run. Universal rent control can help rebalance our economic priorities in NYC. Cynthia Nixon, the former actress and longtime public education advocate who is mounting a primary challenge to Governor Cuomo, announced a progressive housing plan that continues her disciplined assault on the governor’s dismal track record from the left. The plan, called Rent Justice for all, outlines many long-sought after reforms to protect renters across the state. A few real estate publications, including the Real Deal, have been quick to point out that landlords won’t like it. I think this is partially true. Some landlords will absolutely hate these proposals and many of those landlords are quite powerful. However, I’m here to argue that I believe there are other landlords that should welcome stronger tenant protections — the majority of landlords, in fact. Small, local landlords own more than half of the 2.18 million rental units in NYC and most have very little in common with bigger developers, publicly traded property management companies, or private equity firms that have flooded parts of the NYC market. However, small landlords don’t come close to having the same political power, which often means their interests are ignored or actively subverted. Despite this contradiction, these more powerful interests continue to successfully flatten the perception that all landlords are the same homogenous blob (buffered by the generally uncritical real estate press in NYC). This narrative is obviously false, but big developers and Governor Cuomo trade in it freely. For example, the Governor’s Affordable New York plan does nothing for small landlords and gives away millions of public dollars to major developers (while failing to provide enough actual affordable housing). This narrative maintains the strict landlord vs tenant political divide that feeds the toxic decades-old political status quo in New York: A small contingent of highly dedicated tenant groups fight to maintain tenant protections while the affordable housing stock slowly disappears. Small landlords get squeezed. Big developers get more tax concessions and rezoning opportunities. And the affordable housing crisis continues on unabated. Breaking this toxic political status quo is the first step towards addressing the affordable housing crisis on a meaningful level. Housing advocates can start by rejecting the narrative that all landlords have the same shared interests and recognize that small, local landlords are hurt by this dynamic too. We must do more to convince small landlords that they have more cause to work together with tenants. There is no meaningful solution to the affordable housing crisis that doesn’t incorporate small landlords and doesn’t make it easier for them to operate. As Matthew Desmond points out in his Pulitzer Prizing winning 2016 book Evicted, 3/4 of all affordable housing in the US is provided by small, local landlords. We must make the argument that these landlords will benefit from stronger tenant protections. In previous blogs, I have written how I think a universal rental control could work, but to sum up quickly, I stress that it would not represent a simple extension of the current system (to be clear, I support the measures in Ms. Nixon’s proposals but think they must go further). It would be an entirely new system that would also need to offer more diversity in housing options (from co-living to senior living) and would absolutely involve trade-offs that no doubt would appear to be painful, particularly for some older rent controlled tenants. Measures to protect these tenants would have to be included (preferably with federal aid). Clamping down on the small minority of tenants that abuse the current system would also be a necessary step as part of a new system. This is no small task and I understand that many readers will be skeptical of even engaging in this discussion. It is no secret that managing multiple classes of tenants makes compliance more challenging for small landlords. Many of these types of owners are landlords as a second source of income and are not professionally trained or resourced. This invites a lot of mistakes that can turn into costly problems that hurt both parties. Having all renters fall under the same level of protection would remove a number of the steps that most small landlords trip over. Rather than having to follow every evolving law, loophole, MCI exemption, or annual RGB guideline and see how that impacts certain units, both sides would know exactly what to expect and what is required under a universal system. A system where protections are offered across the rental landscape for every unit would potentially alleviate a lot of the tensions between rent stabilized tenants and landlords, particularly on fixing infrastructure within units. Much of the distrust that arises between both parties comes from a landlord’s reasonable need to make upgrades to a unit and a tenant’s reasonable fear that this will trigger a rent increase that may lead to a larger decontrol. Without the fear (and perverse incentive) of vacancy decontrol and bonus, both sides can operate in good faith. It could also offer tenants more options. In many cases right now, landlords and neighbors change while a rent stabilized tenant remains. In a classic example, a tenant might age while their neighbors get younger. This might not be the ideal environment for that tenant, but moving to a better-suited location is virtually impossible financially. Knowing that a system is in place that could provide a similarly priced unit (again, presumably with some federal or state aid) with similar long-term protections could make moving more attractive. Eviction is an ugly, painful process for all parties involved. However, the loss of shelter is simply nowhere near the loss of rental income. Greater tenant protections mean more resources to keep tenants in their homes — and to keep the rent checks coming to landlords. This is already happening in NYC. Mayor de Blasio signed a Right to Counsel bill last year that guarantees tenant legal aid in housing court. These resources mean that fewer disputes will lead to evictions (which could save the city $320m a year). Intervening earlier in the cycle gives the tenant more opportunity to receive the necessary help to maintain good standing with their landlord. No doubt there are bad actors in real estate (more on that later) but for the most part, small, local landlords aren't; they don’t have the resources for a lengthly eviction fight and don’t want it to get to that point. Landlords also generally don’t want to kick people out of their homes outside of the most extreme cases. They want peace and quiet. More resources for tenants means a greater ability to intervene at critical junctions when a tenant may be at risk of falling behind on rent payments. Every landlord can support a process that appeals to their humanity and their bottomline. One of the biggest, if perhaps abstract, benefits of universal tenant protections to small, local landlords would be the shift in the market that would transpire over time. The vast commodifcation of the American housing market caused the Great Recession. Instead of solving that crisis by reducing the incentives to speculate on homeownership, the economy has morphed into exploiting rental housing. The idea that the best, highest use of capital is virtuous on its own merits doesn’t hold up when you see the practical implications of this trend in housing. In many neighborhoods across NYC, poorer residents (many of them minorities) are being replaced by wealthier (largely whiter) residents. (This is a particularly shocking reality in California as well.) Many of these properties sit vacant as investment shields or as Airbnb cash cows. NYC is already one of the most economically stratified cities in North America. Continuing this trend (which mirrors other trends of disinvestment in public institutions and local infrastructure) is simply not sustainable. The long-term viability of the city, let alone a given neighborhood, is at risk if it is simply closed off to all but a select wealthy population. NYC is a city of immigrants, entrepreneurs, and artists — many of them start out poor. Many of them start out renting from small, local landlords. This can not end. I will continue to advocate for more public housing and alternative forms of ownership, but I also believe that the private market must play a central role in property management in NYC. But this must be in the form of local landlords. New Yorkers should be able to cycle into ownership and renting in their communities. As housing advocates, we must acknowledge the importance of local landlords and reach out to them as allies. It is one of those obvious things that gets lost over time, but Governor Cuomo is Governor Cuomo largely because his father was Governor Cuomo. The son worked on the more popular father’s campaigns and what he lacked in his father’s robust liberal principles, he made up for in sharp insider elbows. It was housing where Andrew stepped out from his father’s orbit (as much as you would want or need to when your father is a popular governor toying with the presidency) by setting up a non-profit, Housing Enterprise for the Less Privileged (HELP). The organization did good work then and still does today and I make no suggestions otherwise, but its clear that Cuomo saw housing as a means to score liberal cred while building relationships with powerful developers, a play he has repeated many times since. This cred led to a position under Mayor Dinkins (where he came into contact with future nemesis Mayor de Blasio) as chair of the Homeless Commission where he backtracked Dinkins housing-first policy goals and claimed that homelessness was a “human” problem not an economic one. After Dinkins lost re-election, this “tough thinking” led to a position in the Clinton Administration as an assistant secretary at HUD. His father’s legacy as a working class ethnic liberal from the northeast made his son an easy choice for the southern, conservative Democrat. Both were cynical politicians fluent in empty gestures. Contrary to his father’s robust liberal legacy, Cuomo’s record at HUD is very similar to his later record as governor — lots of big talk, lots of press coverage, some decent ideas, but little follow-through that would challenge powerful interests in finance or politics. He became HUD Secretary in 1997 (Mayor de Blasio was hired to run HUD in NY-NJ) and served till the end of Clinton’s administration very much in the fashion its neoliberal triangulation that has haunted the Democratic Party ever since. That triangulation helped lead to the Mortgage Crisis in 2008, which Cuomo played a role in creating. While half-heartedly warning against lowering standards for mortgages and against the rise of pernicious lending practices, he raised the benchmarks for banks and Fannie/Freddie to issue more mortgages to lower-income households that the agencies ultimately couldn’t back when the market tanked. Some have argued that he is more responsible for the crisis than any other single person. That might be a stretch, but he has never accounted for his role in the crisis. He also did nothing for public housing. This is partly because the Clinton Administration embraced homeownership over rental assistance, which itself was very much a bi-partisan standard given the general dominance of conservative ideology during the era, and also because the Clinton triangulation required the deconstruction of the welfare state. Along those lines, public housing was seen as a place people needed to be moved out of, not into. There were positive efforts to address extremely distressed public housing during the Clinton Administration, but much of it occurred while Governor Cuomo was assistant-secretary in community development. Those efforts lost steam when he became Secretary, despite his claim otherwise. For the most part, HUD abandoned the mission of public housing and oversaw the destruction of many public develops and the withering away of funding for remaining ones. Cuomo didn’t cause the current crisis in NYCHA, but he did nothing to stop the squeezing of federal funds that has crippled it. He has also never accounted for this legacy. The governor has always been a generic product of the political times he exists in and his effort to promote homeownership (a disaster that both parties were guilty of) along side the Clinton Administration’s dismal record on affordable housing, came at the expense of public housing funding and later the nation’s economy. His spotty record at HUD didn’t stop Cuomo from running for governor (again) on his housing cred and name, winning in 2011. Given that he ran on that experience, his subsequent disinterest in housing policy is even more egregious. He could have used that experience, especially the lessons learned from the crisis, to become a major leader in changing national and state housing policy away from subsidizing homeownership and towards funding sustainable affordable housing by supporting NYCHA, rent regulation laws, and alternative housing policies like community land trusts. His campaign narrative could have turned into transformative, highly-experienced governing. Instead, Governor Cuomo ignored housing issues. When he did have to address them, he was lukewarm on protecting let alone extending rent regulation laws and unquestionably friendly to subsidizing big developers. His big public talk always resorted back to closed-room deals with private interests. Not surprisingly, that’s why it costs taxpayers $400k–$600k per unit under the Governor’s affordable housing plan. Governor Cuomo has also completely ignored NYCHA for 7 years. While threatening to declare a state of emergency for the housing authority (which would put its 178,000 homes under state control, bypassing the existing leadership in the agency and the city) and touting an additional $250m for the agency, he keeps reminding us all that the state has no obligation to fund NYCHA. Aside from the obvious shot at Mayor de Blasio, this statement shows on some level the Governor knows his lack of support looks bad. Because it is bad. It also looks bad that the state had already approved $200 million for NYCHA but hasn’t allocated it. He had previously committed $300m in 2015 that hasn’t materialized yet either. This pattern of promising lots of resources for housing but failing to deliver them is a long-established habit. We should be extremely skeptical that these announcements will turn into funding that helps residents any time soon. We should also be concerned that these funds will come with strings attached. He has also already entertained the idea of bringing in private developers if he does declare an emergency. This would only reinforce the perception that for all his talk, he is interested in helping his powerful developer-backers first. Any help for NYCHA residents is welcome, overdue, and deserved, but the fact that we are left to wonder if, when, and to whom it will materialize is a scandal. NYCHA faces a truly daunting list of challenges, some of which are entirely self-inflicted. But it is short $20 billion dollars in maintenance and capital costs. The Governor’s pledge, especially as the former head of HUD, is a sick joke compared to that. Many people have noted that the timing of the Governor’s new found interest in NYCHA comes as he is preparing for re-election and a potential run for the Democratic nomination in 2020 thereafter. He knows Mayor de Blasio is unpopular in many circles (for some self-inflicted reasons, much like NYCHA) and hopes folks that haven’t paid attention to his own indifference for years will see his efforts now and line up to support him. It is an insult to New York voters, but it has worked in the past. But it’s not clear that Cuomo will get much traction or credit for his intervention in NYCHA now (or how sincere he will even be in the long run). Residents know that as rough as they’ve had it under Mayor de Blasio, they haven’t gotten help from Cuomo. It won’t take much to remind them that Cuomo ignored them at two different jobs. It will also be fascinating to see what the governor says about rent regulation laws which are up for renewal in Albany again next year. The annual Rent Guidelines Board meetings will be taking place over the next few months and we can expect many advocates to press the Governor on his position now. His record, as I’ve already stated, has been dismal. Expect him to tout his support for the laws and to mention his $20 billion five year plan for housing in the state but to angle for concessions to developers as he tried to get during the 421a renewal last year. It could blow up in his face this time. This is because, after all these years of triangulation, the Governor is in trouble. He had a taste of this last year during the budget shutdown. Whatever he decides to do with NYCHA and rent regulations, he will alienate a key element of his re-election strategy. He needs Democrats, especially progressives, to back him (or at least remain divided), but he also needs his usual wealthy backers. There are few plausible scenarios where he can secure both. The Governor has never had a strong constituency or political base either in NYC or outside of the city. He has relied on New York’s horrendous voter apathy and deep-pocketed developers to aid his re-election before. Now, however, in the Trump Age, progressives have woken to enemies within both parties and many are gunning for him on the left (even before former-actress, qualified lesbian Cynthia Nixon announced her primary challenge.) Even if he continues his cynical lurch left, very few progressives will buy it and many more voters will be paying closer attention for the first time. Governor Cuomo’s record on affordable housing is clear. He has been at best indifferent and at worst hostile to policies that don’t include massive subsidies to private developers. Under his administration, help for public housing, rent regulation laws, and alternative housing models like community land trusts has been largely ignored, slow-walked, or superficially supported. That hasn’t stopped others from acting in his absence, but the lack of leadership has been glaring given that his entire career is based on his alleged housing expertise. Trying to make up for years of indifference now might get him some press, but it won’t erase a career of opportunism around housing. That isn’t the only reason will never be president let alone the nominee in 2020, but it might very well jeopardize him even in 2018. A report released last week titled “Inclusive City” outlined an extensive plan to redesign land-use policy and related community engagement in NYC. It is the result of a large working group established last year that included elected officials, community groups, professionals, and advocates all tasked with addressing the very serious issues of environmental impact, displacement pressures, and community control. The practical goals as stated in the report are to create a more inclusive, comprehensive, and equitable land-use planning process that will ultimately allow community input in zoning decisions to build more affordable housing. It has a number of admirable recommendations, particularly around adopting New Jersey’s “cross acceptance” process of combining top-down and bottom-up planning strategies. There is a lot to like in this report in terms of process. However, the report fails on a basic level that speaks to a broader problem in the neo-liberal technocratic model: values. First, what are the core public-minded values that can be achieved through better land-use planning? More importantly, in the larger sense, what is the role of our city self-government in defining and supporting the public good? On closer reading, this report doesn’t have a clear answer. This harms the potential impact of the report, but it also harms our ability to identify and address the larger problems facing our city. This is a problem that we are seeing play out at the local level and the national level with increasingly scary implications. Without clearly defined public-minded values serving as the organizing structure and source or legitimacy of our self-government, trust in that government process continues to erode dangerously. The anti-public values that fill that vacuum are even more dangerous to the public good. However, the explosion of inequality over the last 40 years (you know, that whole thing about how 82% of stock is owned by 10% of Americans that made the news this week) and subsequent anger and disillusionment across many corners of the population exposed that, in practice, our national government has ceased to subscribe to those public values. When Congress talks about tax cuts or healthcare, whatever process-based discussion on benefits they turn to doesn’t ring true to most of us; rightfully so. Our national government is anti-public. Though our national government might be failing public-minded values, not surprisingly it is very successful at supporting private profit-seeking values. But let’s be clear, favoring private interest over the public good is not an American value. Promoting the public good through the protection of private interest certainly is. That distinction has been lost in our contemporary society and we are all suffering for it. The problem is that this erosion of pubic-minded values has coincided with the rise of technocratic methods in governing. The sophistication of processcreates the impression of greater public oversight but has actually baked in the anti-public values that undermine it. This is my problem with the report. It first lays out a clear rationale for the problems with the current planning process: it is inconsistent across neighborhoods; it favors wealthier communities over poorer ones; it provides limited resources and recourse for neighborhood groups. It then proposes specific changes and strategies to address them that include all stakeholders. This is all true and good, but to what end? I don’t know. The process is the point of this report. This is backwards. The values informing the process should be the point of the report. I don’t get a sense of what a better planning process will do to materially improve the major problems in the city — a lack of affordable housing leading to greater displacement, a lack of resources for public infrastructure leading to a lower quality of life and opportunity, an inability to plan ahead on climate change and other long-term issues that existentially threaten our future. I’m not saying a better planning process won’t do that. I know it will. But I know what “better” mean to me. People reading this will say “of course the report talks about values” and, yes, it is even titled “Inclusive City” and talks about how it wants more community engagement, buy-in, and control. Inclusivity, decentralization, transparency — they certainly sound like values. But in reality, they are more Stephen Colbert “value-y” terms than actual value claims. The authors of the report believe that a more open rezoning process is good because it encourages inclusivity. They believe that inclusivity is good because it creates more faith in government process. More faith in government process creates a shared vision for the future of the city. Setting aside the potential challenges in executing these recommendations or if they would even address the bigger problems they aim to, none of this articulates what any of these authors think the vision of the city should be, why we should have faith in government process, and why we need that process to be inclusive. Perhaps those values could be something like “because the city has an obligation to provide the basic foundations of prosperity. That all citizens — especially the wealthy — have an obligation to the city and each other. Because there should be more public-ownership of land and resources. Because the only way self-government has legitimacy is if it is pursuing the public good as defined by the engaged public.” That’s just one idea, but I get what a better planning process is trying to achieve then. This report also commits another common technocratic error. It, perhaps strangely given its focus, ignores the anti-public values that in practice have created our city’s land-use problems in the first place (and presumably undermined the success of the current planning regime). It alludes to the current, flawed process but doesn’t name names as to who benefits and why. Clearly some people are benefiting under this system. We can only really understand what this report is trying to change and if it is serious about doing so if it does challenge those that benefit from the current system. Without doing so, the process lets those actors and those anti-public values off the hook. This, unfortunately and perhaps unintentionally, reinforces the basic operating premise of anti-public values that allow that small group of private actors to benefit over the general public good in the first place. The other related problem is that by not calling them out, the report might (again, perhaps unintentionally) allow the casual reader (or voter) to innocently assume that this report is on the pubic good side, while it’s nebulous value claims actually just allow the status quo to remain in place. The average citizen knows how hard living in NYC is, how much inequality there is, but she can’t reasonably be expected to know how land-use policy impacts that. The authors of this report do know (or should know) but fail us by not using their expertise to articulate it and how to fix it. We need them to speak up for the public and the public good. That means speaking out against people that oppose it. Will more community control reduce displacement? Maybe, but what is the community and who gets to define it in any given neighborhood? This report doesn’t say. Will a more inclusive planning process create a more legitimate city government? This report doesn’t say what gives government legitimacy in the first place. If it is still ultimately serving private interest over public interest, who cares if the public has a nominally greater opportunity to weigh in? The powerful will still prevail and the public will still suffer. We only need to look at previous technocratic revolutions in NYC to see that we’ve had this problem before. In 1975 — after the fallout of Robert Moses slash and burn development era — NYC created the modern community boardmodel and ULURP process (which were again reformed in 1989.) These reforms were also about improving process and about inclusivity, decentralization, and transparency. This is the process that now needs a new process. The city does need a new land-use process. The city needs smart, engaged, and trained people to help craft it. We are lucky that so many people are already at the public’s disposal and willing to try. But we must have public-minded values that create the legitimacy of our self-government define the goals that any process should achieve. Without them, process won’t matter. Indeed, without them, process is just a weapon used against the public. Last Monday, a record 4,200 volunteers fanned out across the five boroughs to count how many homeless New Yorkers live outside of the city’s shelter system. The effort was part of the national Homeless Outreach Population Estimate (HOPE) and has been conducted annually through the Department of Homeless Services since 2005. I don’t know if the numbers are available yet, but last year, 3,900 individuals were counted. Many of these victims are probably known to DHS, but getting an accurate count of the unsheltered homeless helps identity people that might not know what services are available to them. In addition to the survey, we arrange for anyone who is interested to get picked up and driven to a shelter and we distribute information about comfort centers around the city. On a practical level, the count also sets the amount of additional federal funding the city gets for homeless services — and the city needs all the help it can get. This is my second year volunteering and, as someone who writes about housing issues a lot, I have been following the shocking rise in homelessness in New York since the Great Recession with increasing alarm. There are 61,000 people in the city’s homeless shelters, the vast majority of them women and children. That is a staggering amount of suffering. HOPE has put this broader crisis into very concrete and intimate terms for me, as I’m sure it has for all of the volunteers. It has made me stop thinking about homelessness as one big crisis and forced me instead to see what it really is: 61,000 individual crises. It’s all too easy for us not see it that way. We demonize every time we object to homeless shelters in our neighborhoods. Some argue about a flawed “process” of community engagement, some about the unfair distribution of shelters in poorer neighborhoods. Whatever validity these arguments have doesn’t erase the fact that most of us don’t want homeless people, especially men, around because we are afraid of them and disgusted by them — ignoring the fact that they are the ones who are more likely to be victims of crime and abuse. Our property values will be fine. We demoralize them because there is no end to this and they know it better than anyone. Imagine the catastrophic events that led someone to being homeless and how that would weigh on that person. Imagine enduring the cycle of shame, confusion, and despair that comes with navigating the limited resources of our shelters and social services. Then imagine that there is no end in sight. Many of the sheltered homeless are women with children fleeing an abusive home. Many cycle through to supportive homes and on to permanent ones. No doubt there is hope. Tangible, obtainable hope. We should be hearing more about these stories because they are important to champion. But for too many, especially the people that I have met canvassing for HOPE, where is the actual hope? Are they going to get the medical and mental care they need? Are they going to get the support from the community they deserve? Are they ever going to get a safe, reliable home? I would be lying if I told any of these men — and I know for sure that I recognized some of them from last year — that I thought so. Maybe they will, but I don’t know. They know better than I do. Many of them were appreciative of our efforts, but in a knowing way that at times made it feel like they were trying to comfort us. So I’d like to say that participating in HOPE makes me feel good and to an extent it does. I am helping and it does matter. I don’t know how the people of DHS, the NYPD, and other outreach groups manage this on a day-to-day basis. Maybe, at least for one night, I’m helping them carry the weight just a little. I hope that helps too. But mostly, when I get home at 4 a.m., I feel exhausted, angry, and full of shame. I am not doing enough. We are not doing enough. I said earlier that I now feel like there are 61,000 crises instead of one big one. But there is one big crisis. Our economic system is obviously failing most of us. Until we fix capitalism — or whatever bizarro form of it we are fooled into accepting — too many New Yorkers will suffer. We are all partaking in a system that demands the dehumanization, demonization, and demoralization of all the poor and vulnerable. Right now, we accept that. It’s easy to blame the homeless and keep on walking down Broadway. It’s easy to blame the feds for not sending enough funding or the mayor for botching the shelter system and volunteer one night of the year. But these are our sins. I hope that more of us see that because if we do, I know we can change it. Is Your Building On the 100 Worst Landlords List? That's a shame because the list is an opportunity for all renters and landlords to assess their buildings and to see what is working and what isn't. Some of the landlords on this list are notorious in the housing world. Others come and go, but more on that later. Either way, understanding how the list works will help landlords (and renters) make sure their building stays far away from it. Here are some key points about the list that every New Yorker should know. This might seem obvious, but unless a tenant makes a complaint to the city - which is as simple as calling 311 in many cases - the Housing Preservation and Development (HPD) department won't initiate an inspection. If HPD inspect's a complaint and confirms it, they issue a violation. Those data points are the basis for the scoring on the Worst Landlords List. For tenants, this means if you see a serious problem in your building and your landlord isn't fixing it, you better call the city. There are lots of bad landlords that don't make it on this list because tenants don't speak up. For landlords, this means you can avoid being on this list by being responsive to your tenants - before they have to call 311. They are your first line of defense against problems in your building. Work with them. As you'd expect, the most insecure tenants need the most help with speaking up. There are many organizations like Met Council, CASA Bronx, Legal Aid Society, and Tenants & Neighbors (among many others) that can help. 2. Violations are counted up over a 12 month period, divided by 12, then again divided by the number of units in the building. So if the same violation is unresolved over 12 months, that counts as 12 violations. The simple metrics listed here shows that this list isn't designed to be "anti-landlord." You have to have a lot of violations over a long period of time to get on this list. And these aren't wishy-washy violations. Class B and Class C violations are things that can put people in danger. You deserve to be on this list if you're on it. If you're still unclear about how the list works as a landlord, check out more info on methodology and also learn more about HPD and what you need to do to stay off the list. Sure, it's embarrassing to be on the 100 Worst Landlords list. It certainly means that you have incurred a fair amount of expensive fines. And it likely means you've spent some time or will spend some time in housing court. However, there isn't much this list can do to you if you're on it. I don't want to sound like I'm against this list. I support it. There are very few widely-available resources for tenants to find out about landlords. The worst actors in the market should be held accountable. This list is a fair attempt to do so. But looking at last year's list, the names at the top are very familiar. That's true every year. The sad reality is, there are very few mechanisms to punish these bad actors in today's market. Many bake in fines and court appearances and obviously don't care about the optics of being on this list. They bought their buildings and are waiting out tenants as property values continue to rapidly increase. It's part of the model. Our elected officials can genuinely oppose this and put out lists to shine a light on it, but real estate - and the uniquely speculative nature of it in NYC - is too powerful a force to allow this list to have teeth. Attaching further fines, criminal prosecution, or even property forfeitures would be impossible politically, even if they would change the stakes practically. I suspect the rather benign metrics for the current list were an acknowledgement of this reality. It's easy to pick on the worst, most flagrant actors in the NYC real estate market. They don't care. But it is much harder to acknowledge the deeper challenges presented by relying on real estate to drive so much of the city's economic and political engine. It's also harder to tap the vastly under-organized power of tenants. Uniting them would change this dynamic overnight. Many tenants across all pockets of the city will continue to struggle as long as that isn't the case. homeBody is the free communication tool for landlords, tenants, and neighbors. We believe housing is a right and so should you. On Wednesday last week, the New York City Council passed a series of bills aimed at protecting tenants from harassment caused directly or indirectly by landlord’s construction projects. In all, 18 bills were passed and are expected to be signed by Mayor de Blasio. The “Stand For Tenant Safety” package comes in light of other recent efforts by the city to help tenants such as right-to-counsel and shows a remarkable shift in housing policy as a response to the ongoing affordable housing crisis. However, without a larger comprehensive redesign of rent regulation laws, these efforts only raise the potential cost of abuse rather than remove the underlying motivations for landlords and developers. When a rent-regulated tenant moves out, the landlord can raise rent a lot more than they can if the tenant stays. That basic logic creates a perverse incentive for some landlords to try to push the tenant out. Such tactics have included cutting off power, heat, or gas; not properly protecting tenants from in-building construction work; physically damaging a tenant’s unit during construction, or doing work or inspections at odd hours of the night or early morning. The intended purpose of these practices is to make life so unbearable for a tenant that they voluntarily move. In other cases, landlords begin construction projects under the guise of upgrades only to intentionally create damage that forces certain tenants (or potentially every tenant) to move. There have been several high-profile criminal cases recently involving landlords who have used these tactics and the stories are difficult to comprehend. It’s safe to say most landlords and developers do not resort to unethical, even criminal, behavior, but it is impossible to know how widespread even milder versions of these practices are across the city. Up until now, the city hasn’t had clear guidelines to identify such practices. Stand for Tenant Safety is designed to find out just how often they occur and to raise the cost of these behaviors. The bills have three main focuses: first, one creates an Office of Tenant Advocates within the Department of Buildings to make it easier for tenants to log complaints about construction work. Second, it increases penalties for construction jobs without proper permits and proper tenant messaging to cut down on scopecreep. Third, it classifies visits or calls from landlords at odd hours as harassment. The bills will make documenting potential abuses much easier for tenants and city officials and will serve as a bulwark against landlords attempting to harass tenants through sabotaging a building’s quality of life. These are much needed protections for all tenants, whether they are regulated or market rate. The current mechanics of the market and the regulatory regime within it guarantee that capital will find ways to force out tenants in order to raise rents. And it will continue to attract the speculator landlord/developer over the service provider landlord/developer. There is an entire cottage industry within the real estate world that specializes in identifying and buying buildings with rent-regulated tenants with the explicit purpose of forcing them out, or to “de-tenant” then flip the building. The industry of course uses euphemisms like “under-performing assets” or “under-utilized inventory” to describe the buildings and uses others like “revitalize” or “reoptimize” to describe the process of kicking out tenants, but the message to investors is clear and universal: Buy low, sell high. Without removing the incentive provided by vacancy decontrol (and other loopholes around rent regulations) all the tenant protections in the world won’t prevent certain landlords from looking for ways out. Only the New York State legislature can change the rent laws to address this fundamental issue. There are many political reasons why that is unlikely to happen anytime soon. I always think of rent regulation in terms of Abraham Lincoln’s famous “A House Divided” speech on slavery. NYC can’t function in the long run half regulated, half market. There is little logic or basic fairness to the system now – for landlords and tenants alike. It needs to be either one or the other. I’ve strongly advocated for universal rent regulation for rental apartments in order to avoid the more fundamental problems that our current mixed market encourages. Only with an entirely new rent regulatory system, one that doesn’t look like the system we currently have to be clear, can we really avoid the type of speculative displacement that is eroding the long-term health and diversity of the city. It's also the only way to remove the more speculative, short-term actor from entering the landlord business in the first place. In the basic Econ 101 model, rent regulated units are akin to any distressed asset like a failing business. If an asset is not performing to its “highest, best use” you change some variables and try to make it more productive. This type of business will always attract a certain type of speculative buyer. That’s fine if you’re talking about a restaurant or even a publicly-traded company. It’s not so simple if you’re talking about a home. A home is more than an asset. How you measure the utility of living in a home – especially one that the resident rents – is difficult to measure in our classical economic models. That doesn’t mean it’s impossible to measure, it just means that it involves assigning value to certain activities or behaviors that most economists have shied away from historically. As a result, we have plenty of economic research about the “costs” and “damage” of rent regulations (although all data collection is subjective to a degree) based on classic models, but don’t have much research that measures the broader “health” of a city with rent regulations. These models aren’t interested in the empirical state of a city as much as the theoretical state. The discussion about rent regulations comes down to one of values. On the one hand, creating more economic activity and growth is a good thing for the city. On the other, how much activity and where it occurs can be a bad thing for the city if it isn't spread out. Mayor Bloomberg famously thought having every billionaire in the world living in NYC would be great for the city. We currently do have the most amount of billionaires, but it’s hard to argue that the city greatly benefits either through their economic contributions, tax contributions, or social contributions. For a democratic society to truly be healthy, you need a variety of incomes (and their resulting economic and social contributions) to be stakeholders at the city and neighborhood level. If housing is treated as a commodity, that system breaks down over time, as it has been in NYC. Our failing rent regulatory regime is just a symptom of this larger illness. Until we address this problem on a larger, fundamental level, we’ll never escape the cycle of landlord’s looking to get around rent regulations. No city-level laws will ever be able to keep up. As Mayor de Blasio gears up for his re-election campaign, he has been touting his progress on his signature policy initiative, affordable housing. In an Op-Ed for The Daily News last week, he highlights how his $41 billion plan to create or preserve 200,000 affordable housing units over 10 years is on budget and on schedule. In the last fiscal year, nearly 24,00 such units have been allotted, the most in a single year since 1989 (for a total of 78,000 since 2014). The administration’s focus on affordable housing has been commendable and real progress has been made, but the larger picture is less sanguine. The affordability crisis and the homelessness crisis in NYC (which the Mayor appears to treat as a separate issue here) will not be solved by market-based solutions alone. We need much deeper federal government intervention on a number of fronts. The Mayor’s affordable housing plan relies on several key premises (which mirrors the national focus of the LIHTC). First, it calls for attracting private development to drive construction. Second, it requires those developers to include a certain percentage of affordable housing units with each project. Third, it incentivizes that private development with tax breaks. The second and third premises have been highly controversial, while the first one has not been as much. Starting with the second premise, in 2016, the Mayor passed his Mandatory Inclusionary Housing and Zoning for Quality and Affordability laws which require developers to set aside a percentage of units for “affordable housing” and continues a general trend to upzone new neighborhoods in the city. These were both met with heavy resistance from neighborhood groups worried about displacement and new development, but ultimately passed the City Council. That it takes so much political capital to create a basic environment for more development is disheartening and, despite his plan’s flaws, the Mayor deserves credit for recognizing this and following through. However, it’s not surprising that residents would be wary of private development based on other experiences in the city. The third premise has also run into controversy, though of the political variety. The Mayor’s plan relies on tax incentives, notably the toxic 421a program. Governor Cuomo stunned many people when he allowed the program to expire and used it as a political football to undermine the mayor’s plan. The Governor claimed he had a better plan himself (which never really materialized) and the program has been rebranded as Affordable New York. A recent article estimates that the subsidy costs NY taxpayers $400-600k per unit - while not producing nearly enough units (or in some cases any affordable units, due to lax oversight). Somehow this is "just how it works." This brings us back to the first premise, which is the original sin of all of these policies. Relying exclusively on the private market to create (and to a lesser extent preserve) housing units is an expensive, inefficient, and inequitable way to create affordable housing. To state the obvious, it is incredibly expensive to build in NYC. Land, labor, materials, planning, and design – all of these things are expensive and, for the most part, there are no secret shortcuts around them. The lack of productivity gains in the construction industry in recent decades is a fascinating sideshow to this larger conversation, but the important point is that these costs are largely fixed for any type of developer. Once you accept this, the only way to really build cheaper is to have the federal government involved. First, it can borrow money for a lot less than the private sector, which keeps costs down (we’re missing a golden opportunity to improve our infrastructure as a result). And second, it doesn’t have to turn a profit. This means it can build the housing that NYC needs rather than what the market rewards. All of the tax incentives in the world will not cover the difference between what is good for the bottom line of a private company and what is good for the public interest in the housing market. Relying on the private sector also crowds out alternative models of housing and ownership. The Mayor isn’t staffing people with this experience, isn’t listening to housers with this experience, and isn’t drawing political contributions from people with this experience. Large-scale co-living spaces, community land trusts, or (heaven forbid) more public housing all get ignored as policy tools or goals when a market-based approach runs through planning. This is a missed opportunity to consider new ways to use existing funds and assets under city control. A truly transformative housing approach would include market-based and non-market based solutions because the goal would be simply to lower the cost of shelter. The goal for the mayor’s housing plan includes this, but also includes keeping powerful real estate developers happy and at least keeping neighborhood groups and homeowners from openly revolting politically. It also internalizes a hostile Albany and an indifferent Washington. I don’t envy the Mayor’s need to balance these political realities, but clearly a bolder vision is not only necessary, but could be very popular with voters, and serve as a rallying point to change the nature of housing policy in the US. Mayor de Blasio was elected on a progressive platform not seen in the city for 20 years, which remains popular (perhaps even more so after 2016). He doesn’t appear to have any major rivals despite constant badgering from the press (not entirely undeserved). And yet 27,000 arguably affordable units is the best we can get? It is under a market mindset. We have been tinkering with neoliberalism for the better part of 40 years at the national and local levels and it demonstrably isn’t working for 80% of the country. Voters want new ideas. Many technocrats want those new ideas to come from local city governments given the paralysis at the national level. So far the Mayor has passed on matching his progressive rhetoric with progressive reforms in housing. It’s a shame because there are lots of good ideas - some old, some new, but hardly any that are radical - that the mayor should be willing to explore. Many of them can be tried without Albany or Washington. But the truth is the Mayor de Blasio needs the state and particularly the federal government to take on a larger role in the affordable housing crisis. There are too many macro economic forces at play with the affordable housing crisis, which is why over 99% of US counties are suffering from it. Only a stronger federal commitment to housing, to wealth equality, and to tax policy can make a difference on that level. The Mayor can be more helpful in forcing Albany and Washington to change the status quo on housing. NYC is the biggest city, the most powerful real estate center, with the largest public housing population in the country. If you want to change the conversation on housing, NYC is the place to do it. That change must include thinking about housing outside of the narrow, flawed lens of the market. The Mayor needs to think bigger and I think he would be rewarded for doing so.